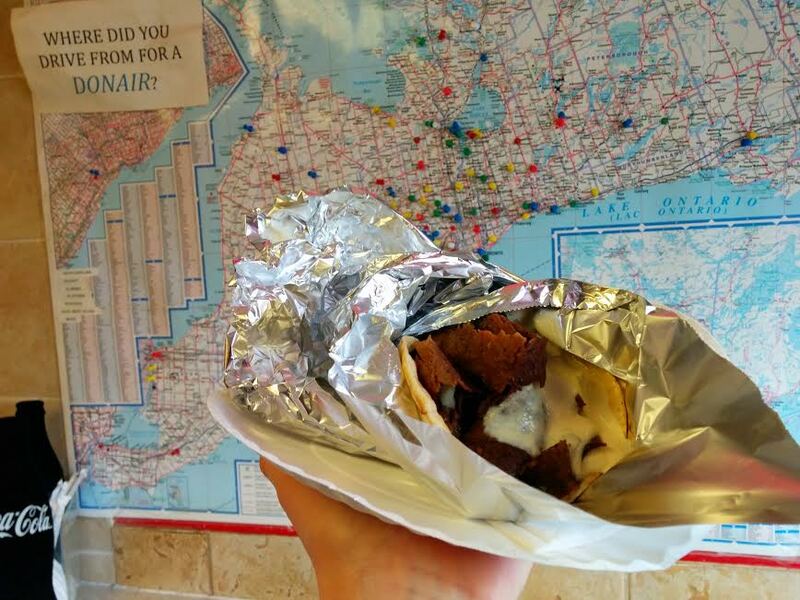 Donairs in Toronto: Where to find Halifax style donairs in Ontario? I recently took a trip to Toronto with my main pursuit being a donair investigation. I think it’s important to document the transmigration of the donair across Canada, and to examine any alterations. It would also be useful to have a database of donair shops across Canada, as a resource for homesick Maritimers. Ontario does not exactly abound with donairs. Canada’s secondary donair region is actually Alberta. But whereas Albertans tend to think of donairs as an Albertan food, Ontario pays homage to the donair as an East Coast specialty. One notable shop is actually called “Halifax Donair”, and other shops advertise with Nova Scotia flags waving out front. 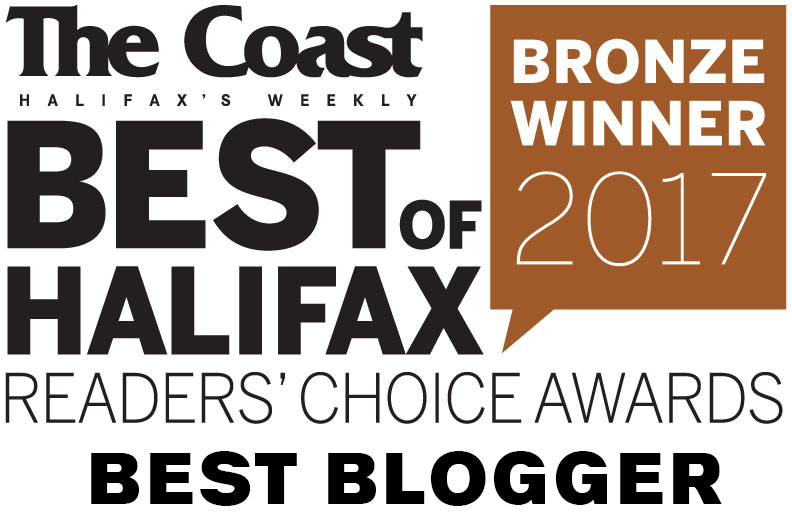 I was inspired by an article in Post City Toronto entitled: East Coast wrap stars: Toronto gets collectively obsessed with the Halifax-style donair. The article mentioned a few restaurants that were serving Halifax donairs in Toronto. I wanted to try them myself. This is a little no frills pizza shop in downtown Milton, with barely a counter for eating. 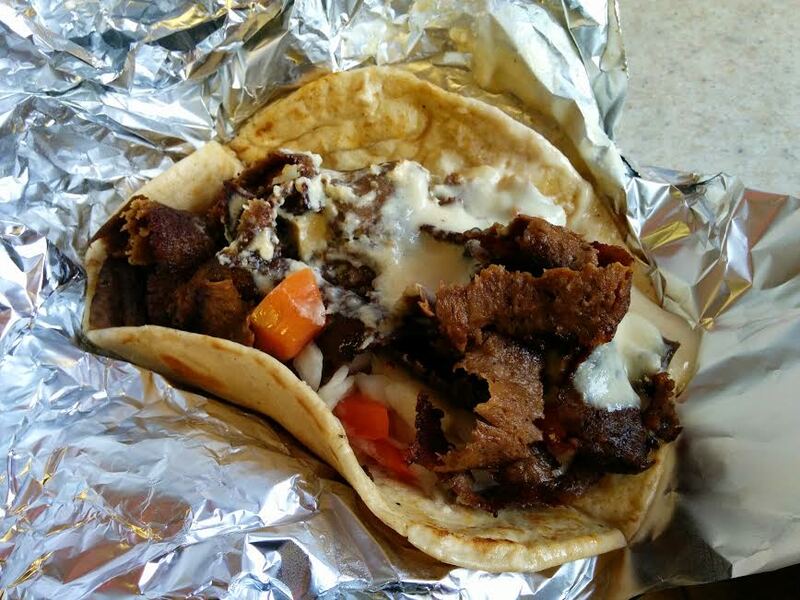 There are 4 sizes of donair: Small (Snack) – $6.50, Medium (Hungry) – $8.50, Large (Starving) – $11.50 and Super 1lb. (Haven’t eaten in days!) – $20. I ordered a small, but found it to be generously sized and stuffed with lots of meat.The meat seemed “soft” to me, but had a nice spicy kick. The sauce seemed legit. The pita, however, was kind of crispy – which struck me as being “not-like-home”. When I inquired, I was told that they carefully dip the pitas in water before frying, which is the proper and original way to prepare pita for donairs. I’m pretty sure this is no different that the current Halifax method, so I’m not sure how to explain the crispiness that I experienced. Jim, the owner, was involved in Halifax’s donair scene back in the 80’s during the legacy of the Gamoulakos brothers. (Read the story here). He told me that the way he makes donair is the way it was made in Halifax, at least prior to 1995. Have donairs changed since their inception? How so? Is it a Greek vs Lebanese thing? Has there been standardization? I left the shop with so many questions floating in my mind, and feeling as though I had somehow eaten something from the past? The lovely Albanian couple who run College Falafel pride themselves on being Toronto’s donair pioneers. They started serving east coast donairs in 2004 when someone from D’Escousse, Cape Breton came into the shop and told them they could tap into a whole new market. I guess these Capers sent a donair recipe to College Falafel, who implemented it – at first without a rotisserie. They now have a sign on top of their awning that proudly advertises “East Coast Donairs” and it is available on their regular menu alongside chicken shawarma and co. It is one size only, for $8.00. Despite the fact that the owners know what’s up, I suspect a lot of donairs are eaten here with lettuce and shawarma ingredients. They also use red onions and I was asked if I wanted hot sauce. Nope. The first thing I noticed about this donair was that the pita wasn’t prepared properly. It was not heated, and it was split open and stuffed. It felt more like eating a pita wrap than a donair. Then I realized the meat was chopped and not sliced in strips off the spit. It had a soft texture that reminded me of meatloaf. The meat was slightly crispy from the grill, but it didn’t have that familiar density. The flavours were good and the service was lovely – I would totally come back for a falafel. 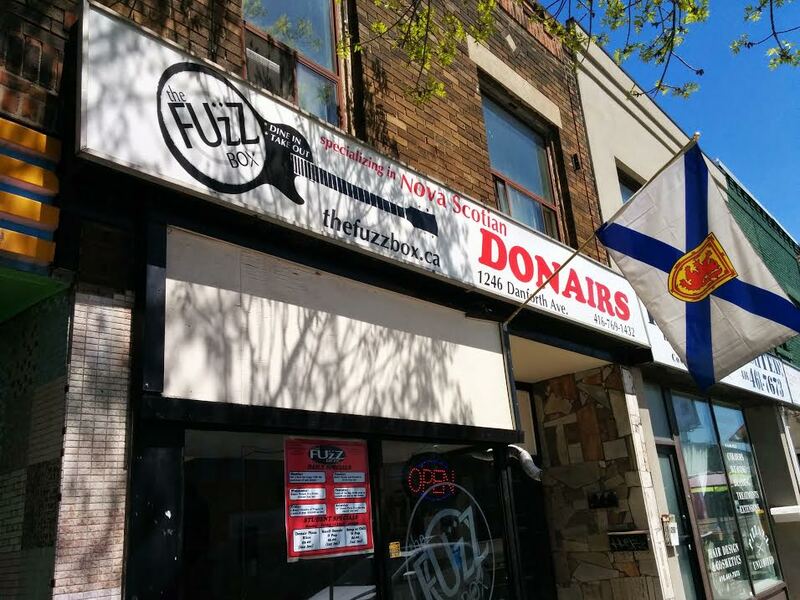 The Fuzz Box was opened by Neil Hohn, a Berwick native who had never worked in a pizza shop but saw market potential in East Toronto for this East Coast delicacy. Working from various sources, he made 12 attempts before he perfected his own recipe. Now you can find his donairs on Toronto’s Danforth Avenue (TTC Greenwood station). He also sells donair pizza fare & poutine, garlic fingers and east coast potato skins. My first bite of meat was a little too crispy, as the meat was a little “crumbly that day”. The Fuzz Box donair meat is oven baked in loafs and then grilled, for better or for worse. The situation improved as I worked my way in. The meat was, again, soft. This is the third time I’ve found the meat in Toronto’s donairs to be soft and meatloaf-like. I wonder if this is because they are house-made, whereas perhaps most Halifax shops have outsourced to mass produced loafs? I should also mention that Neil is using soft Greek pitas. He told me that when he originally ordered pitas he assumed he would be getting the typical Lebanese-style. When the Greek ones arrived he discovered that they were more sturdy and pliable than their Lebanese cousins. He steams them on top of the meat as it grills. 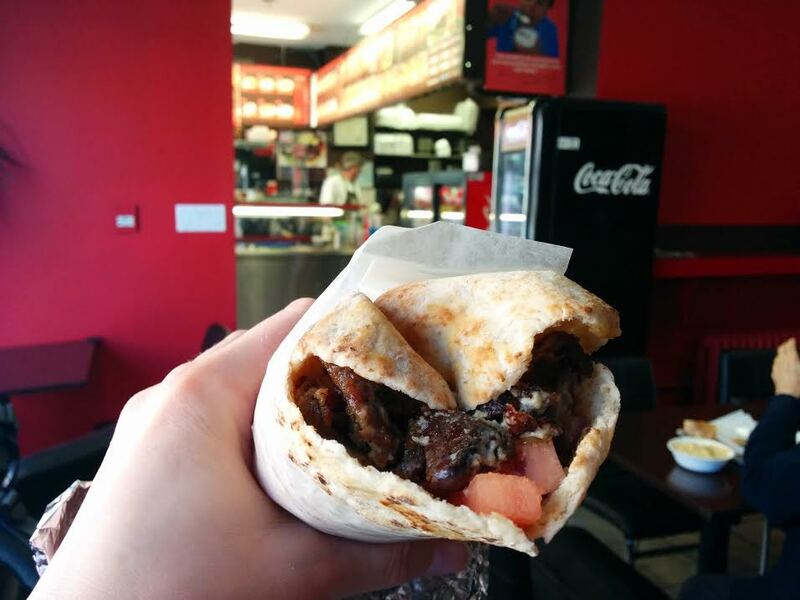 This donair is big, sweet and decadent. But I don’t know. I think this is too different from what you’ll find in Halifax. Then again, donair aficionado Michael Dinn of Donair.org loved this donair. You can read his review here. *Update: Hopgood’s Foodliner is now closed for business. This makes me very sad, but you can now find Chef Hopgood at Lightfoot & Wolfville Winery in Wolfville, NS. Hopgood’s Foodliner is not a place where you would expect to find donairs. This is a trendy small plates kind of place, located in Roncesvalles Village. Chef Geoff Hopgood is from Halifax. 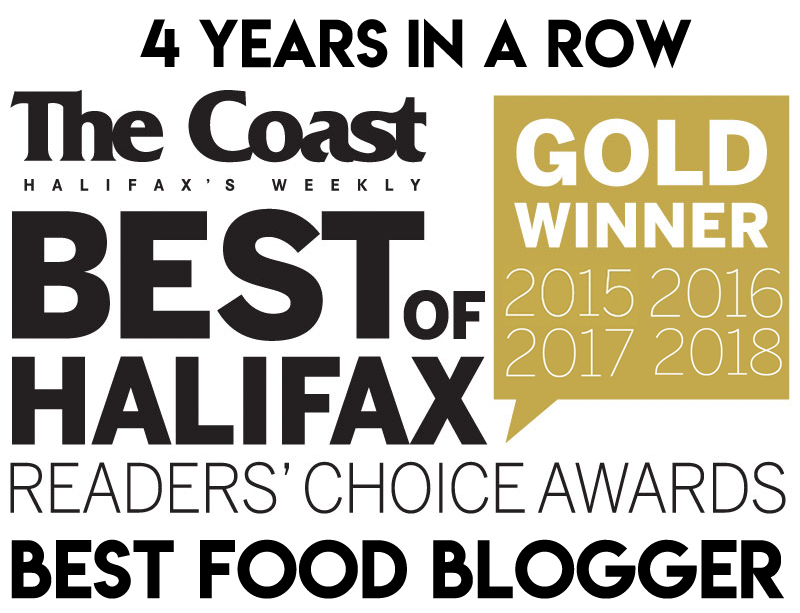 His family used to own supermarkets around Nova Scotia called “Foodliner” and his Maritime inspired restaurant pays homage to family tradition and Nova Scotian cuisine. 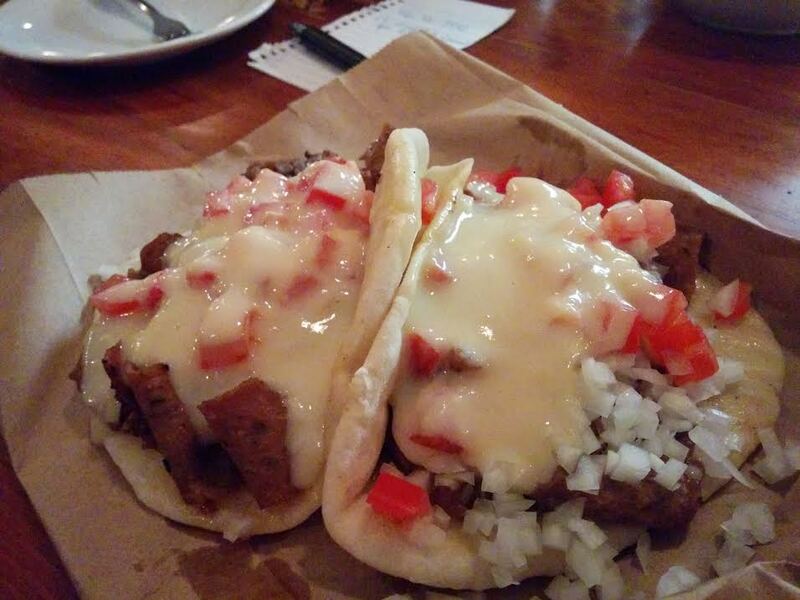 This can only be described as a “donair sharing plate” or “taco-inspired”. Instead of a plate, however, these are served on a flattened brown paper bag in a gesture of faux authenticity. 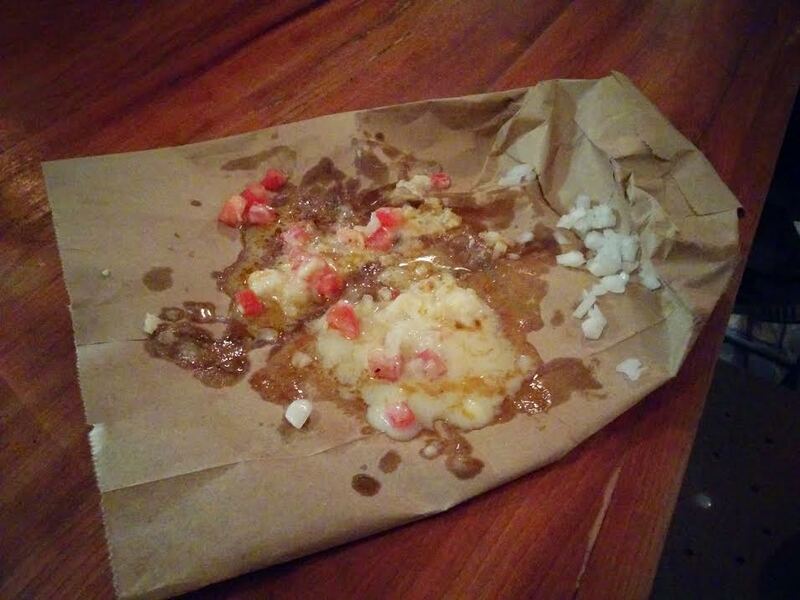 I know what you’re thinking: This is not how donairs were meant to be eaten. This is pretentious. This is a farce. But you know what? 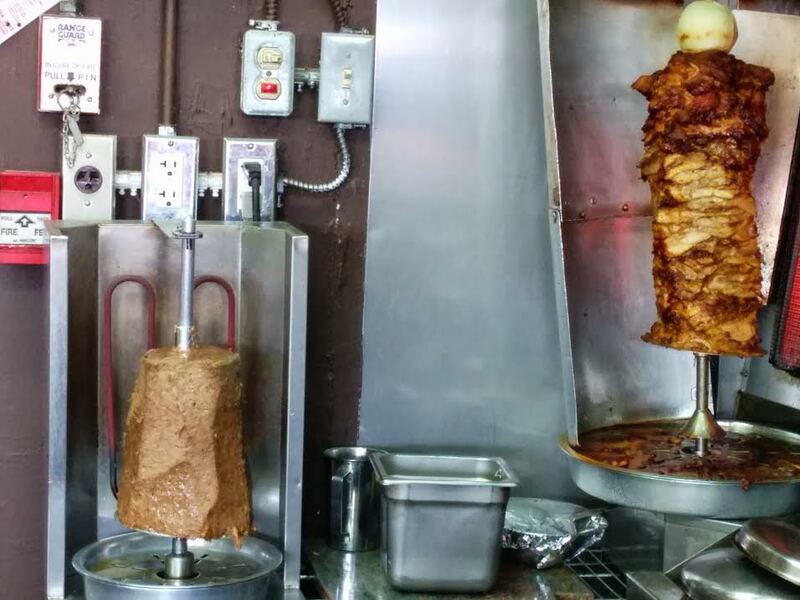 These are the best damn donairs in Toronto! So what?! That’s damn useful! So, maybe the meat is cooked sous-vide…. Oh well! This achieved that nice chew that was missing in all the other Toronto donairs. The veggies? They are chopped fine, betraying the fact that these donairs are chef-driven. The pitas are house-made, too. And they’re awesome. I don’t know what it is, but these donairs were so on point with the tastes and textures of a proper Halifax donair. The only crappy thing is that this isn’t the kind of place that you stumble into drunk and get ’em wrapped in tinfoil to eat drippingly on the curb. It’s great for a donair tourist, like me. But it won’t recreate the whole donair experience for a homesick Maritimer. You can’t have it all, Toronto! Do you know of any other places in Ontario that sell East Coast donairs? *Update: This post was written in 2015 and a couple of the restaurants have since closed. If you know where to find donairs in Toronto nowadays, please let me know in the comments below! Close to Windsor (one of my favourite cities!) – I’ll definitely check it out when I get a chance. Thanks for the tip. Centretown Donair and Pizza in Ottawa has a big sign out front saying ‘Halifax Donair’, and has a NS flag. My friends have ordered their garlic fingers and claim they are legit. 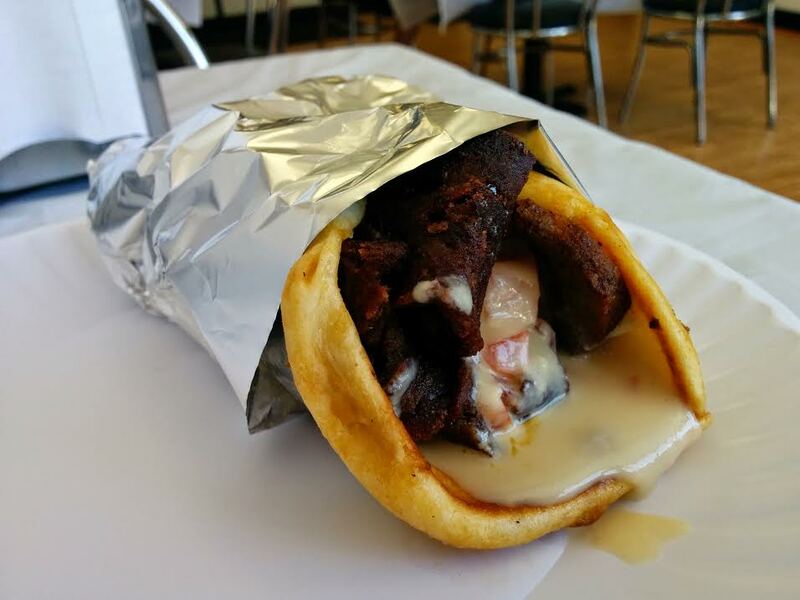 Whether the chain was sold or not, it’s still known as Halifax Donair to most.